Tours on natural sights of Kyrgyzstan. Almaty - canyon Charyn - Check Point «Kegen» - museum Przhevalskii - town of Karakol - lake Issyk Kul - settlement Kochkorka - pass Kalmak-Ashuu of 3446 meters above sea level - lake Song-Kul of 3106 meters above sea level - pass Kurtka of 3173 meters above sea level - settlement Baetovo - pass Beurailily of 3268 meters above sea level - pass Kulak-Ashuu of 3420 meters above sea level - caravan-serai Tash-Tabat - pass Ak-Beiit of 3281 meters above sea level - pass Tuz-Bel of 3574 meters above sea level - pass Torugart of 3752 meters above sea level - check point «Torugart». Distance of the route: 879 km. Highlight tour from caravan-serai Tash-Rabat to pass Torugart. Arrival in Almaty. Meeting in airport, transfer to the hotel”, accommodation. Rest. Breakfast. City sightseeing: visit to the 28 Panfilov’s guardsmen park, Cathedral, Museum of national musical instruments, National museum, Medeo gorge, Republic square. Lunch and dinner in local eating house, overnight. Day 2. Almaty - canyon Charyn - settlement Kegen - pass San-Tash - town of Karakol (390 km). Breakfast. Transfer: Almaty - settlement Chilik - canyons of the river Charyn (200 km). On way visiting to Charyn of a canyon, descent in canyon, on the main canyon we reach the river Charyn, walk in vicinities of canyon. Returning to the beginning of descent in canyon. Further the road trasnfer to pass Kegen of 1980 meters above sea level and through 60 kilometers we come to frontier of Kazakhstan and Kyrgyzstan. Dealing with formalites of customs and boundary service of Kazakhstan. Lunch in a way. The further transfer: check point «Kegen» - pass San-Tash (21 km) («Tanerlans stones»). Stop on pass the San-Tash walk in vicinity of stone mountain. 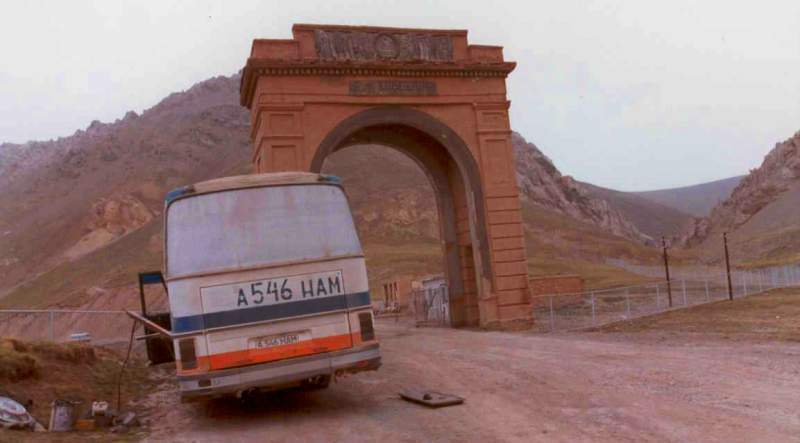 The transfer before: pass the San-Tash - settlement Tyup - town of Karakol (90 km). Our way lays in Issyk-Kul hollow to town of Karakol. Arrival in the town Karakol, transfer to hotel, accommodation, dinner and overnight. Day 3. Town of Karakol - gorge Dzhety-Oguz (43 km). Breakfast. Transfer: Karakol - settlement Dzhety-Oguz - gorge Dzhety-Oguz - natural boundary Seven Bulls (36 km). After breakfast excursion in gorge Dzhety-Oguz, walks at the river Dzhety-Ogu, in natural boundary Seven bulls in vicinity resort Dzhety-Oguz of 2200 meters above sea level. The further transfer: natural boundary Seven bulls - natural boundary the Kok-Zhaiyk (7 km). Walk in vicinities of natural boundary, walk in the Valley of colors. Here per 1973 spent trainings the Soviet cosmonauts, there lived cosmonauts in sanatorium Dzhety-Oguz. Returning to Karakol. After lunch a trip on excursion in museum Przhevalskii (12 km). Visiting of museum of M.N.Przhevalskii, tomb of the great traveller on high I protect lakes Issyk Kuls. Returning to Karakol. On way visiting of masterpiece of wooden architecture Dungan of mosque (1907) and Troisk wooden orthodox church (1895). Lunch,, dinner and and overnight. 4 Day. Gorge Atyn-Arashan (30 km). Breakfast. Transfer: Karakol - settlement Ak-Suu (Teploklychenka) - thermal sources the Altyn-Arashn (30 km). A trip on excursion in gorge the Altyn-Arashan. We receive the greatest pleasure and we all be gratification magnificent kinds, pure mountain air and an opportunity to bathe in hot springs. Two, three hours walk in high gorges. Picnic on the nature. Returning to resort. Bathing in thermal springs. Returning to Karakol, dinner and overnight. Day 5. Town of Karakol - Orto-Tokoi water basin - settlement Kochkorka - pass Kalmak-Ashuu - lake Song-Kul of 3106 meters above sea level (414 km). Breakfast. Transfer: Karakol - southern coast of lake Issyk Kul - settlement Kochkorka (284 km). The settlement Ottuk will be the last at southern coast of lake Issyk Kul, thus we see all southern part of lake Issyk Kul extent hardly more than 200 kilometers. After we pass lake Issyk Kul ahead of us large water basin Issyk-Kul of hollow - Orto-Tokoi expects. On site from the city of Karakol up to settlement Kochkorka in greater settlements there are gasoline stations. Arrival in settlement Kochkora, visiting of craft workshop in settlement, Arrival in settlement Kochkora, visiting of craft workshop in settlement, visit of museum of an applied art, we can take part in creation of felt carpets "Ala-Kiiz" (The Motley carpet), walk on local market. Breakfast. High-mountainous jailoo in vicinities of lake Song-Kul for the Kirghiz shepherd the best. Here for the summer drive the herds of horses, herds cattle and flocks of sheeps many shepherds Naryn of area. Foot walk on coast of high-mountainous lake, trip to stones Manas (Tash-Tulgasy). Visiting yurts the Kirghiz shepherds, acquaintance to nomadic life of the Kirghiz shepherds. In second half of day horses riding on slopes of ridge It Baur-Ala-Bas up to height 3500 - 3600 meters above sea level, the majestic panorama of lake with yurts shepherds around of it both grazed herds of sheeps and herds of horses whence opens. Lunch. Day 7. Lake Song-Kul - pass Kurtka of 3173 meters above sea level - settlement Baetovo - pass Beurailiyu of 3268 meters above sea level - pass Kulak-Ashu of 3420 meters above sea level - caravan-serai Tash-Rabat (280 km). Breakfast. It is one of picturesque mountain roads, some passes who will be on our way and will add our travel by beautiful kinds of mountains Kyrgyzstan, on way we visit yurts shepherds, we try koumiss and airan. Lunch in a way. Arrival in natural boundary Tash-Rabat. Accommodation in yurts camp in the beginning of gorge before picturesque rocky gate in spur of ridge at height about 3000 meters above sea level. Dinner and overnight. Day 8. Natural boundary Tash-Rabat - caravan-serai Tash-Rabat - pass Tash-Rabat (11 km). Breakfast. After breakfast we make trip to caravan-serai Tash-Rabat IX century (5 km). Visiting caravan-shed. After excursion in caravan-serai we make walk on pass Tash-Rabat of 3964 meters above sea level (6 km). Picnic on the nature. Returning to caravan-shed on way of rise. Transfer to camp. Dinner and overnight. Day 9. Natural boundary Tash-Rabat - pass Ak-Beiit of 3281 meters above sea level - pass Tyuz-Bel of 3574 meters above sea level - pass Torugart of 3752 meters above sea level - check point «Torugart» (110 km). Breakfast. Departure camp in natural boundary Tash-Rabat at 7.00. We again come back to line Bishkek - Torugart, we turn on the left and we move in southwest direction to the Kyrgyz-Chinese border. Arrival on check point «Torugart». Passage of customs formalities and passport control of boundary service of Kyrgyzstan. After customs transfer to the Kyrgyz-Chinese border (7 km). Transfer to China. Golden Eagle show-hunting in Djety-Oguz valley (KZT) - 106400 per group. Folk Show in Karakol (KZT) - 72 200 per group. Entrance fee for visit to thermal springs at Altyn-Arashan (KZT) - 1900 p/p. National game “Upak - Tartysh” at Song-Kul lake (KZT)- 68 400 per group. Demonstration yurt setting at Song-Kul lake (KZT) - 38 000 per group. Visiting workshop of local felt carpet makers at Kochkorka (KZT) - 2280 p/p. Horses riding at Song-Kul lake (KZT) - 1900 per hour. Day 7. At transfer from lake Song-Kul in natural boundary Tash-Rabat in case of strong rains transfer through passes Beurailyu and the Kulak-Ashu becomes complicated and consequently we provide transfer through the city of Naryn, settlement At-Bashi and further in natural boundary Tash-Rabat.